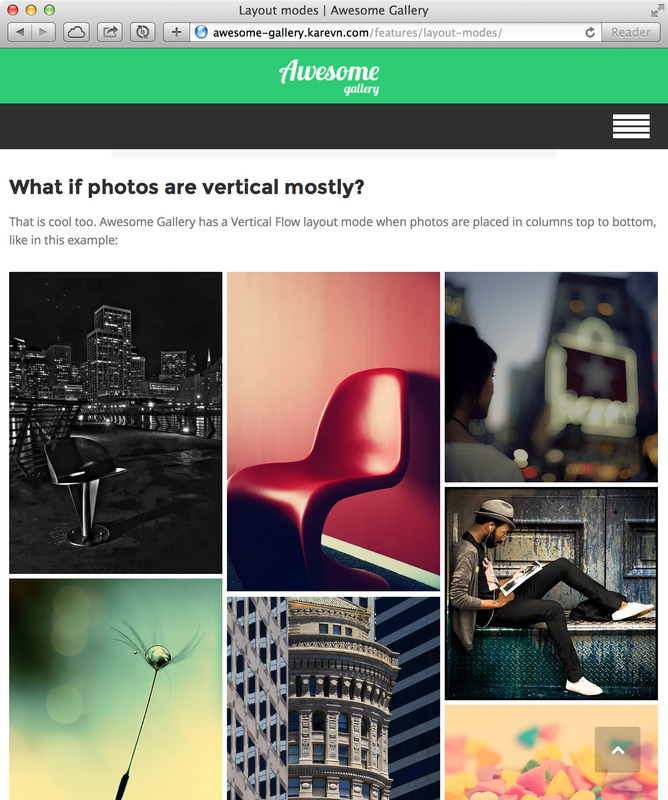 Vertical flow distributes your images in an equal width columns without cropping them. Works great for portrait photography or other cases when most of images are vertical. For some cases, classic grid layout is best – like logos, dribbble shots, so on. 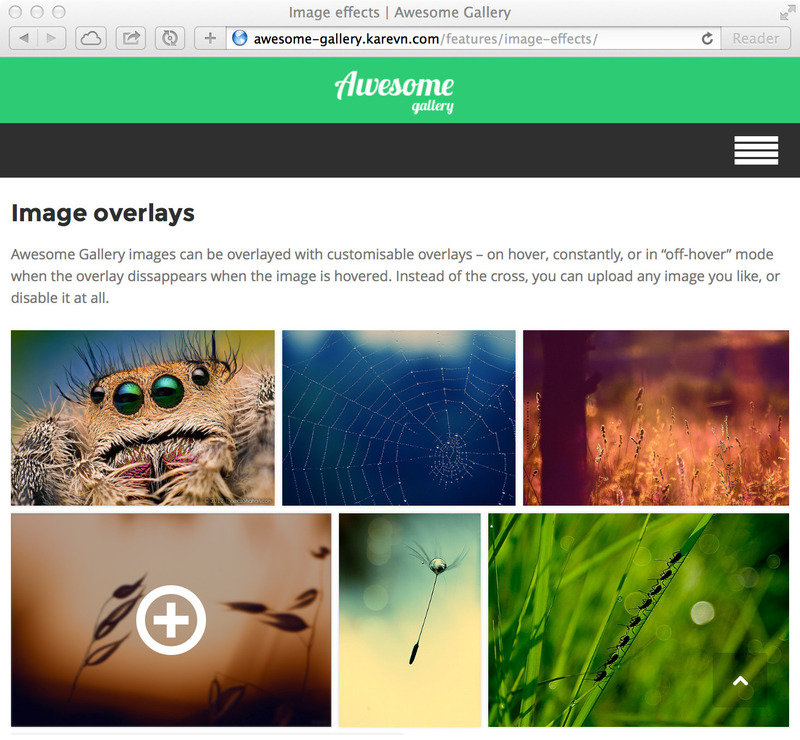 Awesome Gallery supports it too! 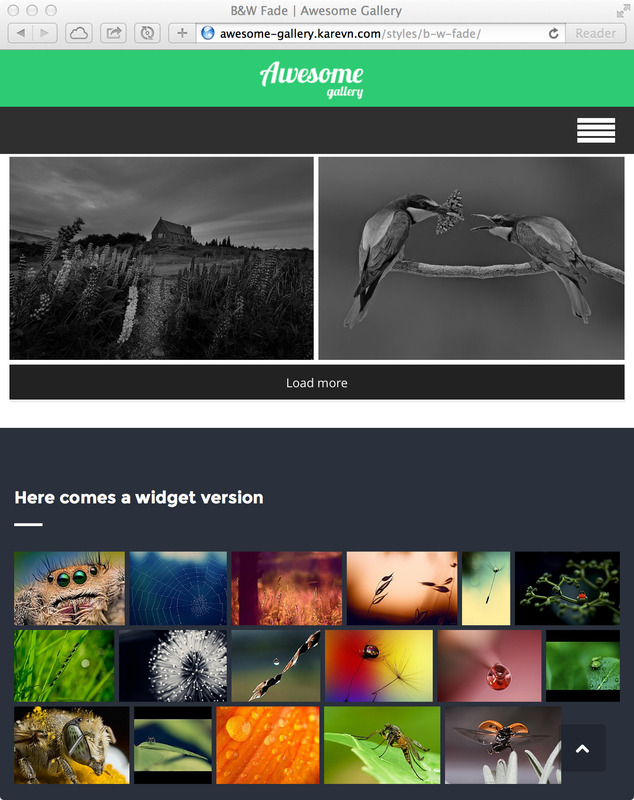 Layout customisation – you can change image width / height parameters, image spacing. 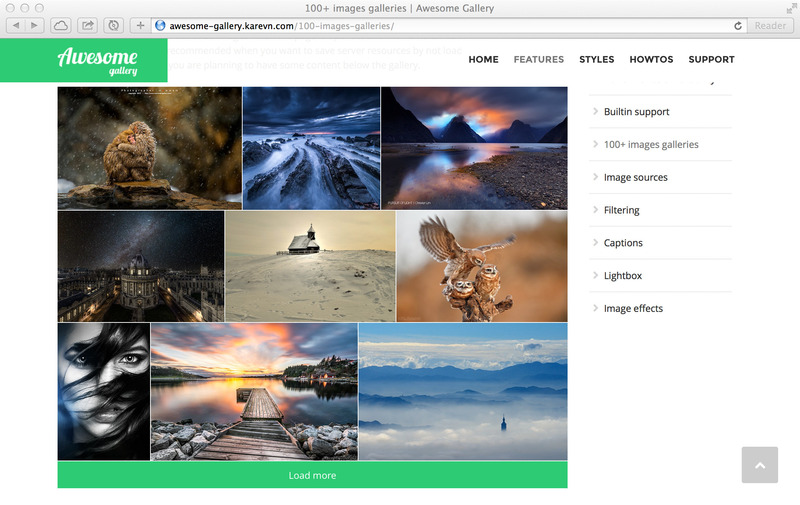 Gallery max width can be restricted, and alignment applied. One-image galleries are supported for sake of uniform image presentation. 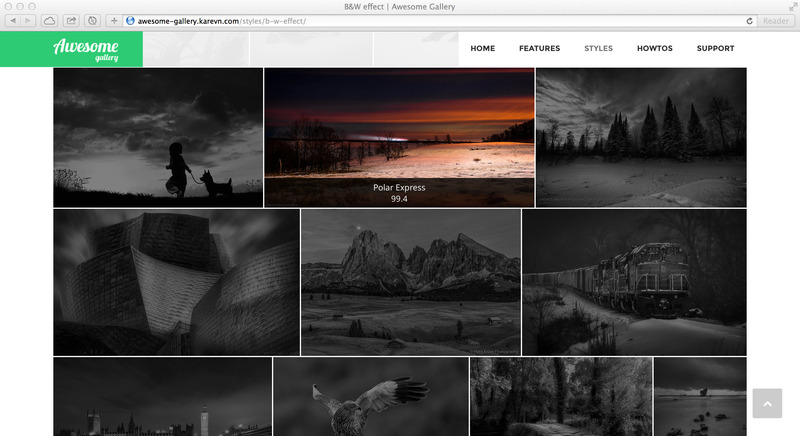 Rocket fast CSS3 image effects – grayscale, and blur. Customisable image borders and shadow. Customisable overlays with unique CSS3 animations. Customisable captions with unique CSS3 animations. You can use Google fonts for captions. Data pre-fetching technology. When the cached data from services like Flickr is about to expire – it is refreshed in background without adding a delay to page loads. Data unavailable notifications – if the data for any of the galleries will become unavailable, a message is send to site admin and the most recent version of data is used for displaying a gallery. Self-diagnostics and problem reporting using an unique builtin support feature. JS is loaded only when it needed to save bandwidth. CSS override for images, captions, filtering and load more feature. Localization-ready. (using standard WordPress technique). No data will be lost during updates. 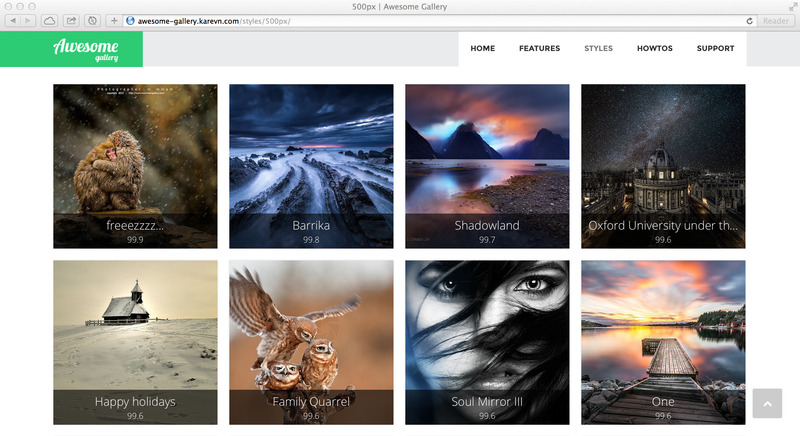 Multiple awesome galleries on the same page work just fine. Check for updates (new versions are released to auto-updates mechanism slightly sooner than they are approved by CodeCanyon). Build your galleries. It is strongly recommended to disable caching plugins while building your galleries – out of sync issues are really strange and hard to fix. Open your FTP client of choise, upload the folder unzipped to your WordPress installation’s wp-content/plugins folder. Make sure you did not add an extra folder hierarchy and plugin .php files are right at wp-content/plugins/awesome-gallery folder. 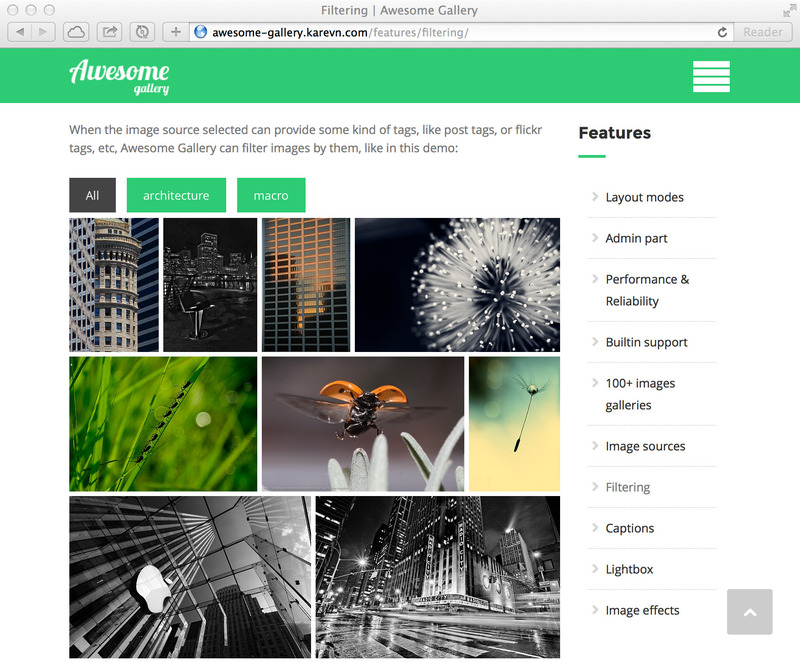 Log into WordPress admin area, go to “Plugins”, find “Awesome Gallery”, click “activate”. Outstanding support is not just a buzzword for me. 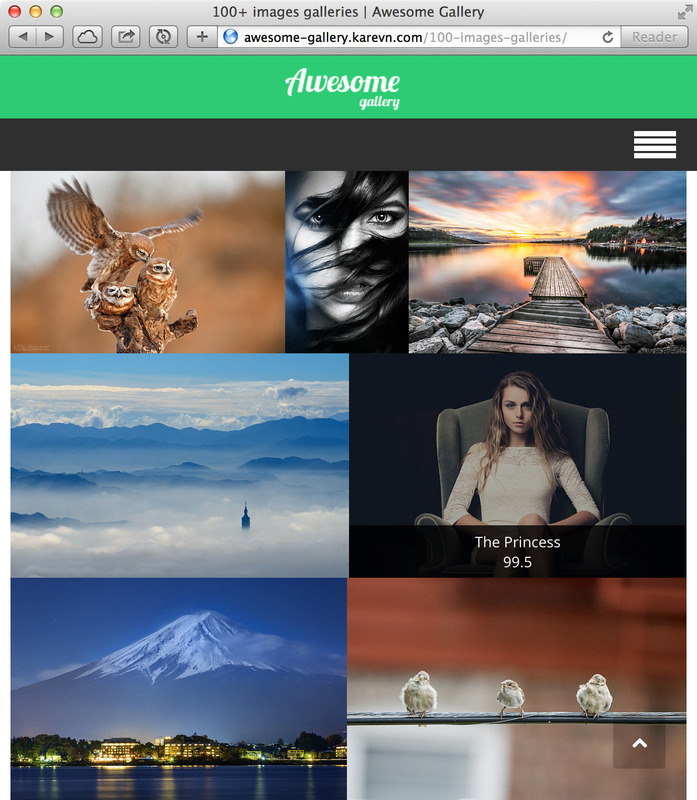 Awesome gallery is packed with a built-in support request feature which allows me to gather all the technical information required to resolve the problem if any. And I am carefully gathering the support statistics to find solutions for repeatable problems. It is best to use the plugin’s builtin support feature, but if you want – you can leave a comment at the comments tab, or drop me a direct message – I am happy to help all the time. WordPress – latest versions are always supported. Updates are released within a couple of days after new WP release. WP Super Cache + Better WP Minify – Recommended caching / minification setup. Fast, smooth, easy to setup. W3 Total Cache, WPRocket – may cause problems when script minification is turned on. WPEngine, SiteGround, BlueHost, ASmallOrange – no compatibility issues. WPEngine and SiteGround are recommended. Improved compatibility with folder installation (no additional timthumb config needed). Fixed a caption problem with Manual image source. Top priority fix – problems with loading Isotope library in some environments fixed. Fixed filtering + lightbox issue. Added support for external timthumb config. A minor issue with on-hover captions fixed. Added “Images not loading” troubleshooting guide. Lots of compatibility fixes, including manual image source, Facebook, NEXTGEN, etc. Minor fixes for lightbox integrations. Removed the dependence on isotope. Facebook and Flickr performance optimisations.